Whenever a novel, movie, or TV show sets out to tell a story related to faith, these works tend to fall into one of two categories. The first category is the one that is very up front with the audience about what it wants to do. This tends to include explicit dialogue where two or more characters have a bald theological discussion, usually with a lot of insider language involved. Sometimes the story justifies this by one of the people happening to have a seminary background (think Mack in The Shack), or they just luck into it because the writers just want them to say certain things (pretty much all the main characters in Left Behind). Whatever faith-related point the people in charge want to make is usually at the expense of the story, and the result is an inferior and pedantic piece of art. The second category allows the story to lead the way, where the spiritual side of things becomes more embodied in what the characters do. The recent Martin Scorsese film Silence, as well as the classic book on which it is based by Shusaku Endo, is an example of this. Yes, the main characters are Jesuit priests, but the messages both versions explore are presented in such a way that they don't clock the viewer or reader over the head. There is no point in a film like this where the priests sit down and basically say, "Here's what you the person watching or reading this should take away from what we're doing." I went into viewing The Road to Edmond with some degree of hope that it would be more like the second category than the first. I cannot say that it succeeded. I can't even say that it lived up to being the type of film it presents itself as. But I can say that it has its moments despite itself. We first meet Cleo (Nathaniel Welch), a youth pastor in an evangelical church who is informed right at the start (via email!) that the governing board is giving him a two-week leave of absence due to a yet-to-be-revealed misstep. Within 30 seconds of receiving this notification, he's off on a bike trip with a backpack, sleeping bag, and fishing pole. Unfortunately for Cleo, this ride is curtailed when he stops to rest at a country store and his bike is run over by a beaten up white van driven by Larry (Tripp Fuller, a co-writer of the story and familiar to some as a podcaster and author on themes related to progressive Christianity). Larry basically embodies most characters that Jack Black played in his younger years: an untethered schlub who speaks with a stoner drawl, the perfect foil for more straight-laced serious Cleo. Larry doesn't exactly apologize for running over Cleo's bike, but he does offer him a ride. It takes Cleo only a moment to get over his indignation about this series of events: he climbs into "White Lightning," and our plot is set. All of this, by the way, happens within the first 10-15 minutes of the movie. Both men's stories begin to leak out in small portions as they ride along: the root cause for Cleo's suspension is a doctrinal issue that also has real consequences for someone under his pastoral care, while Larry is on a quest to the city of Edmond to make peace with a family issue. Each man's story gets a particular treatment, and I think that this is where the trip the film wants us to take hits a rocky road. Cleo's issue, the movie decides, is going to be the cause of explicit theological conversation placing it firmly into the first category mentioned above. As soon as he divulges that he's a youth pastor, Larry pounces with a series of questions and provocations, which he puts down and picks up again for the next hour or more. The setting for this is in the van as they ride, and then a two-day layover that the pair experiences by a river when the van stops running. Whether sitting around a campfire or next to each other in the front seat, the two trade comments about the nature of faith, what some churches require for people to feel included, and how far-reaching God's grace actually is. The subplot of this part of the movie is Larry also trying to get Cleo to loosen up, chiefly in the form of provoking him to swear, drink, and smoke pot. The longer these two spend together, the more Larry's story begins to take over. The film pretty much forgets about Cleo's issues for a while as we learn more about who Larry is, where he's going, and how he seems to know so much insider lingo when it comes to church life. (It's also notable that Larry's Jack Black tendencies also fade the further into his story we travel.) Cleo becomes an observer for a series of tasks that Larry needs to undertake as part of why he's on the road to begin with, at least one of which feels incredibly shoehorned into the narrative even though it serves as a big reveal for Larry's background. By the end, Larry completes his quest in a satisfying and definitive fashion. It's an ending that does well in communicating the emotional depth of his struggle to find peace for himself, embodying something of the second category of faith depicted in film. It's a beautiful moment, and I was genuinely impressed with Fuller's acting during that scene. Cleo's story, on the other hand, seems to continue past the credits. He may have some clarity about his path forward, but we're not as sure in part because we spent so much time the second half of the movie with Larry. 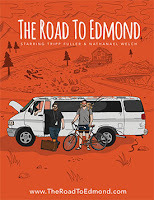 Those looking for a more progressive film that explores faith issues in explicit fashion will find what they're looking for in The Road to Edmond. The conversations between Cleo and Larry are often very straightforward and could provide fodder for discussion. Unfortunately, the story structure sometimes suffers for the sake of these points. For example, I could have done with less time of the two drinking and pontificating by the river without any forward movement. This lag in the narrative also means more time for Larry's antics, which started to grate before the movie started focusing more on his journey. Likewise, Larry could have made a few less stops on his pilgrimage in order to move things along. The aforementioned shoehorned scene could have served the movie better if there'd been less of these other pauses and if presented as his other main purpose for travel on the way to where the final resolution happens. Unfortunately, the film didn't make those choices, and the story is a little more meandering than it needs to be. In fact, there are many times when the movie can't really seem to decide what it is. Is it more Cleo's story or Larry's? Is it a bare theological treatise or a tale where the spiritual aspects are more incarnate in the characters' actions? One thing for sure is that it is an exploration of progressive faith and the toll that more conservative forms have taken on people over the years. In that regard, there is something in The Road to Edmond for individuals or groups to talk or think about.